Steve’s first taste of cooked greens came in the late-‘80s. They were prepared in a modest home somewhere in central Florida (Tampa? Ruskin?) and they were amazing. It would be years after those first tastes before he rediscovered collard and mustard greens. Our diets improved dramatically when we moved to San Francisco in the mid‘90s in part because we started including fresh, bold greens into our grocery routine thanks to all the ease of access created by the purveyors in our neighborhood. And unlike the way greens are cooked in the South, long and slow, when you cook them the California way, they’re a quick sauté, spending time on heat just long enough to become a little tender while still chewy. 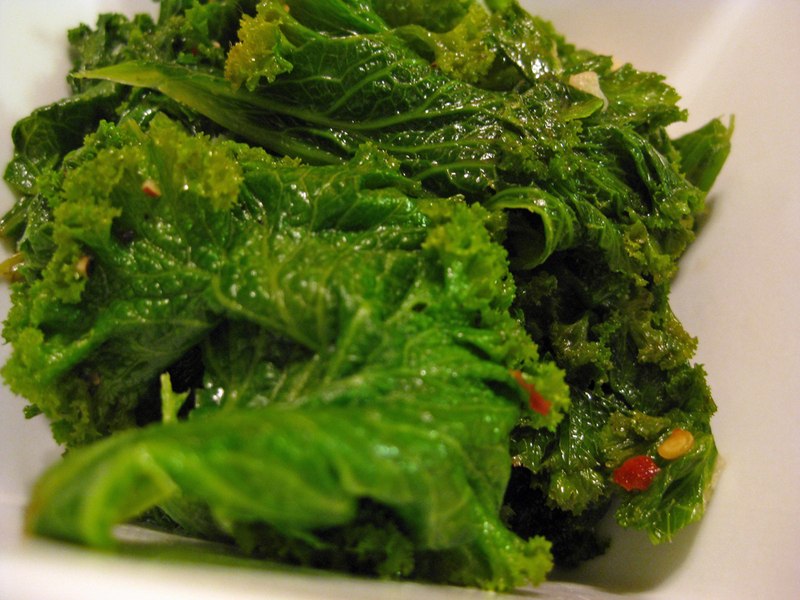 Mustard greens are sharp with their peppery, spicy and slightly bitter flavors – perfect with olive oil, garlic and chili pepper flakes. These greens are real “super food” that delivers impressive quantities of vitamins and minerals in a single serving. They’re delicious added to hearty soups and clear broth noodle soups. They can be baked in gratins or shredded and added to stir fry. We like them pan cooked in hot olive oil. 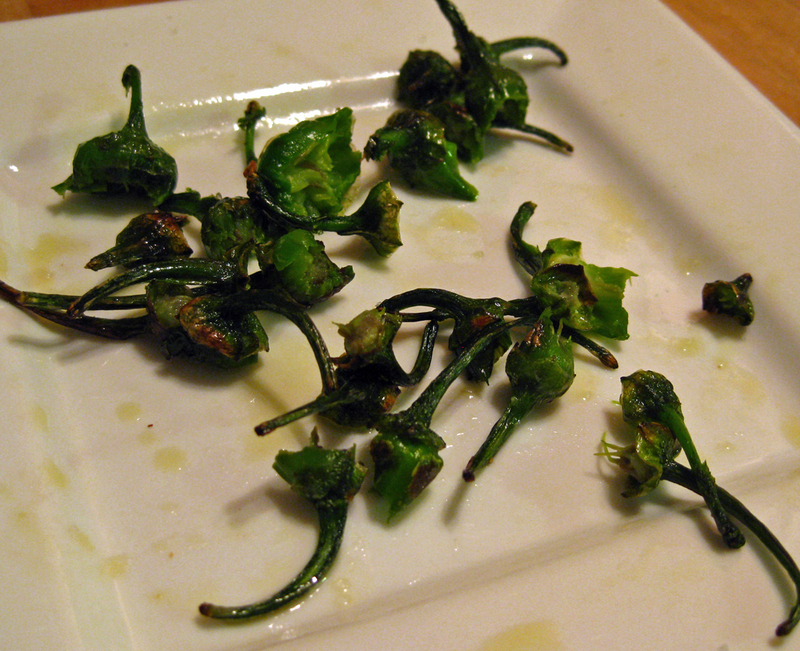 They retain their bite and their herbaceousness when cooked quickly at high heat until just wilted. Pan wilted greens make a perfect side to rich meat dishes. The astringent greens cut nicely through the sweet puree adorning the roast as well as the cheesy polenta that we served with it. Wash the leaves and remove the stems. The stems can be used in the sauté, or frozen for another use, or composted. If using the stems, cut into small pieces and sauté for 5 minutes before proceeding. Roll the leaves together and cut into 1” ribbons. Heat the olive oil in a sauté pan. Smash the garlic and cut into large pieces (at the stems at this point if you’re using them, add to the hot oil, cook for 1-2 minutes or until fragrant, along with the red pepper flakes if using and cook for 10 seconds then add the greens. Season with salt and pepper. Cook for 5 minutes, turning with tongs. Add a little water, about 2-3 tablespoons, to the pan along with the greens to avoid burning the garlic. Cover the pan with a lid and cook for another 5 minutes. Check the pan often and add more water if necessary to make sure the pan doesn’t dry out. Check the salt and pepper and re-season if necessary.